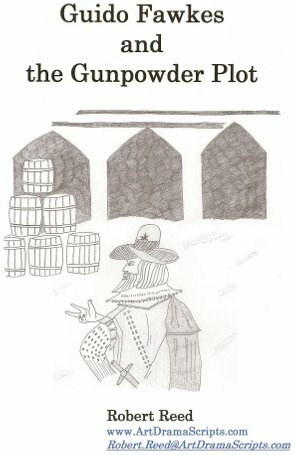 Light-hearted and amusing portrayals of the Gunpowder Plot. These original plays combine historical information with humour to retell one of Britain's most famous stories. 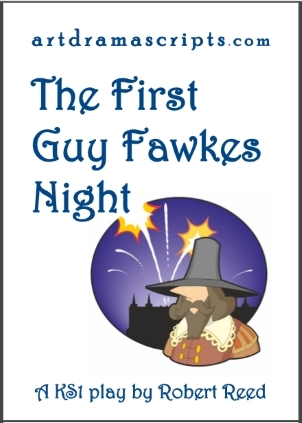 The play has been written to educate and entertain audiences of all ages about the Gunpowder Plot of 1605. Everyone remembers the name Guy Fawkes, but who were the other plotters and what did they hope to achieve? and spark children's interest in history. It's 20th May 1604 and Robert Catesby is meeting with his closest friends in the Duck and Drake tavern. They hatch a plot to blow up King James I and all his lords at the next sitting of Parliament and then stage a Catholic uprising. Guy Fawkes is given the job of lighting the fuse. What could possibly go wrong? Read more about each script below. Why did five blokes in a pub decide to blow up Parliament? Were Early Seventeenth Century entertainments so boring there was little else to do for fun? Was Guido just a nutter who loved blowing things up? All will be revealed in this play. The play has been written for performance by children in Years 3 and 4. The run-time for the play is 20 minutes. The play would suit class sizes of anywhere between 24 to 27. There is a range of roles for different abilities. There are 9 roles recommended to be performed by boys and one role that is recommended to be performed by a girl. The play script contains copious production notes as well as details concerning the set, props and suggestions for music. The set is very simple and there are minimal movements of the props during the play. Five angry plotters meet in 1604 in the Duck and Drake. Later Guy Fawkes places barrels of gunpowder under the House of Lords and all's ready; but, one letter ends up in the hands of the cunning Robert Cecil, the King's First Minister and Spy Master. Poor King James needs help to work out that his life is in danger. Finally, a search of the Parliament is ordered, and the barrels of gunpowder and Guy Fawkes are discovered. Guy Fawkes is now sent to the Tower and questioned by a Cockney Torturer who has an unusual way of making him talk. The other plotters have failed to get support for their rebellion and bravely charge the King's soldiers. And the plot is over. What do we celebrate on Bonfire Night? 'Guy Fawkes Night' (also known as 'Bonfire Night') is celebrated in the UK on 5th November. It's generally an occasion to have a barbeque outside with friends and family, warmed by a large bonfire, and watch a firework display. It's all pretty harmless fun. Ah, and on the bonfire is an effigy of Guy Fawkes. But, what on Earth did Guy do to have an effigy of himself burnt every year? Did he try to ban One Direction, or was he up to something even more sinister? Was Guido just a nutter who loved blowing things up? All is revealed in these plays.